I had a lovely time here. The view of Flores island and sunset was amazing. It's clean and even has some gym equipment. What I liked most was that Grethel and Jorge were really great hosts, they really made me feel like family. Beautiful location and very helpful staff!! Private room was great. Had a VERY comfortable mattress and a warm shower! Wifi only worked downstairs however. Was great having free coffee and filtered water :) The owners don’t speak much English but were still very helpful and so lovely! Best if you know some Spanish or have google translate to help. Excellent place ! Helpful and smiling stuff, Would go back anytime ! Beds and pillows were exceptional! Staff are amazing and super accommodating. We booked an extra night last minute and they shuffled things around so we could stay in the same room. The hostel is located on the other side of Flores however they have the loveliest boat driver who takes you around the lake as you please. Loved that place, staff is amazingly friendly and always ready to help. I would go again anytime. It’s more of a hotel than a hostel and arranging to get the boat back can be a little bit annoying if you don’t have WiFi - however it’s in a beautiful spot and swimming and jumping of the deck is dreamy. The beds were really comfy, shower was hot and it’s really clean. Cool little hostel on the other side of the lake to Flores town. Beautiful sunset from the rooftop there; was just annoying having to call the guy from the hostel to come get you on a boat for the average traveller who doesn’t have access to internet all the time! It would be much easier if they came across on a schedule (once an hour) so you could just plan around it. Other than that, no complaints! Hostel was quiet, but relaxing. We booked and paid for an 8 person room with private bathroom but were given a 12 person room and were told the room we booked didn't exist. We were swapped to an 8 person room with no bathroom and ended up having the whole room to ourselves. Door had no lock on it, so anyone could enter at any time. Lockers were small so could only fit valuables. Though didn't have any problems with thieves. Boat operator was very friendly. Check in lady was not so welcoming. 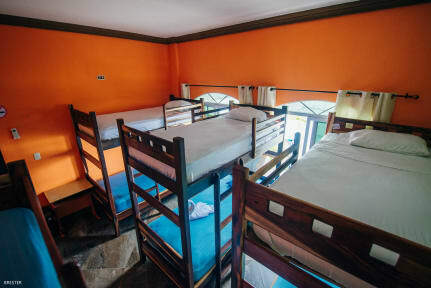 The hostel is nice but you have to realize it is located in the city of Flores! However they offer free boats vice versa from 6am until 9pm, out of that time zone its 10Q one way. When I called the hostel and requested transfer they told me they have an issue with their system and that they were fully booked. Fortunately, they arranged a bee for me somehow. The restuarant of the hostel has really poor service and food for the price. And they room fee is too expansive since you are not in flores. The hostel is on the other side of the lake, which makes it very difficult to enter the hostel. 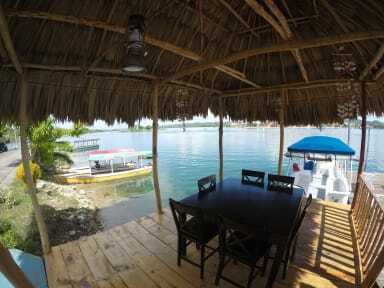 You are very dependent on the small boat, that the hostel has to reach the location. So, whenever you want to go to flores, you need to wait for somebody to give you a ride. Whenever you are in flores and want to go to the hostel, you need to find a place with wifi or to call the owner in order for them to send the boat. This is some kind of a pain and gives you no flexibility at all.